In addition to new construction roof installation and design, our skilled roofing contractors are ready to handle whatever repairs pop up over the lifespan of your commercial roof. When repairs become extensive and/or the roof materials have reached the end of their lifespan, we can work with you to evaluate the options for full roof replacement. 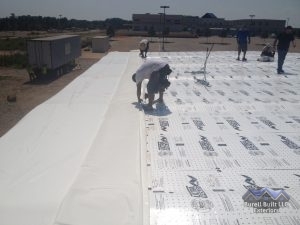 The team at Burell Built Exteriors understands that this is a big investment, and much like when the roof was initially installed, quick, effective work that creates limited mess and disruption to business are highly important. Whether we’re working on a small office building or a large commercial structure, we treat each job with keen attention to detail and integrity in our workmanship. Our owner will regularly check job sites (especially for commercial customers) to ensure that we’re consistently bringing the level of service that we expect from our contractors on every single job. If you’re considering commercial roof replacement in Knoxville, TN or Chattanooga, TN, don’t hesitate to call us at (865) 385-6926 for a free estimate and thorough inspection. There are several factors that may contribute to the decision to re-roof your property. They’re not all that different from what we’d consider when inspecting our roofs at home for replacement. However, the stakes are higher when you’re talking about a larger scale project, and your professional livelihood depends on being able to serve your customers or tenants. When the cost of repairs coupled with the overall age of the roof/roofing materials is outweighed by the benefit of getting a new, solid roof, it’s worth it to go ahead and invest in re-roofing. Materials are drastically improving year after year, and many commercial property owners find themselves with stronger, more energy efficient options than they had to choose from previously. Certain systems will also become more cost effective given the competitive market and plethora of new technologies. You may also consider that the more efficient systems, or even the aesthetically-impressive options–such as green roofing or metal roofing–would simply offer an advantage in terms of long-terms savings and resale value. So you don’t necessarily have to wait for damage or excessive wear to consider the benefits of an upgraded roof for the property. Count on the Burell Built Exteriors team to properly inspect, tear-off, and dispose of your existing roof, and trust our expertise for quality commercial roof replacement that will last you many, many years! Call us today in Knoxville, TN at (865) 385-6926 or in Chattanooga, TN at (423) 702-4042. Updated on September 16, 2016 at 1:24 pm by Burell Built Exteriors.